The surge in the crude oil price has greatly benefited the major oil exporters such as the gulf states, Russia, Venezuela, and Norway. Despite Britains consumption of crude oil roughly matching production, the rise in crude oil has resulted in a huge continuing revenue bonanza for the British government through profit share on production, taxes on oil company profits and from tax revenues on domestic consumption, which has lead to protests amongst hauliers and motorists. Despite a peak in UK oil production at 3 million barrels a day in 1999, the oil price rises since have ensured a near steady gain in oil sea revenues that have more than offset the reduction in output. The expectation is that the high oil price will now make smaller and more expensive oil fields profitable with the average cost per barrel of North Sea Oil remains at under $20 per barrel and therefore this is expected to lead to an increase in oil production over the next few years, thus contributing to UK's oil profits bonanza continuing for many more years as cost rises towards $25 per barrel are substantially below a crude oil price north of $100. At an average price of $110 the UK will rake in record revenues of more than $60 billion from just crude oil. Add the value of gas production then this year could see revenues in excess of $100 billion. Contrary to government statements, the oil bonanza will boost government coffers by as much as $40 billion this year (£20 billion) which gives plenty of scope for the UK government to cut taxes on fuel duties for motorists that are already one of the heaviest taxed in europe. Perhaps this may form part of an election engineering strategy during 2009? The UK has benefited hugely from the North Sea Oil and Gas Bonanza to the tune of more than $1 trillion. What have successive governments done with all this bonus cash ? WASTED IT ALL! Without exception, the whole lot has been wasted on inflationary, uncompetitive public sector works, and not one single penny of this $1 trillion has been set aside. Had we followed the example of Norway we would now be sitting on a sovereign wealth fund of more than $250 billion, even after allowing for half of the money having been wasted on public spending projects. $250 billion would generate at least $15 billion of revenue per year, and therefore act as the countries pension. The sensible governments of Norway have ensured that a large part of their North Sea oil money sits in a Sovereign Wealth Fund that has mushroomed to more than $250 billion or $53,000 for every Norwegian. Even the corrupt gulf state dictatorships have managed to build-up huge cash mountains despite having siphoned off hundreds of billions over the decades through corruption. 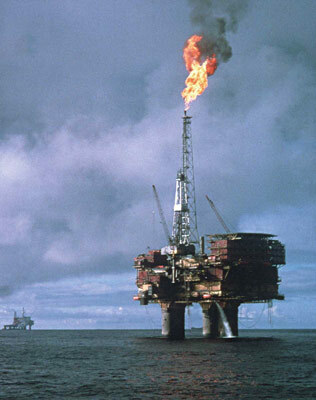 When North Sea Oil eventually runs down, what will we have to show for it ? And how will we cope with the loss of revenue that has helped keep Britain economically afloat for going on 30 years. If we we had sensible government then we would be now setting aside 50% of every penny earned from North Sea for the hard times when North Sea Oil will be no more. Instead the monies have flowed into black holes such as the NHS where money meant for healthcare is pocketed by managers, doctors and GP's, hence a tripling in budgets has resulted in barely a 30% increase in output.